EMMANDUS INSPIRATIONAL NETWORK! : MONEY TALK! I have decided to break the ice and speak (or, write, rather) about the subject of money. Based on feed backs and different comments I have received recently, so this week I will do a series around that. Today I will talk on some ground topics or make a foundation for our discussion. I am not yet the 'guru' on the subject of money,Yeah I am still on my journey to financial freedom, however as a student of wealth creation through the school of involvement I have some invaluable tips to share. It is that basic, we all live our lives around money and I believe 90 if not 100% of our lives revolve around money but our educational institutions most times did little or nothing to prepare us for this. We should therefore first ponder on how much of the concept of money we understand.I will make some bold attempts to explain some basic concepts. 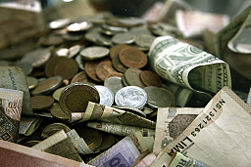 To start with, Money is a medium of Exchange: In a value system you exchange money for a service or product of value. That is why at the back of a dollar bill you will find a line of information ' This note is legal tender'. Money is any document that has legal backing as a legal tender in a value system.So simply put money is anything you can exchange for value. I also believe the concept of Money as an idea, as opined by Robert Kiyosaki. This means money is really an idea, it evolves from and is really an idea. The concept of money is an idea that defines the reward system for certain value and thus becomes a standard in a specific community, society or in a given economy. I believe these two explanation will suffice for a good definition of money outside an Economics class. There are majorly two types of income or earnings i.e passive and active income.. Passive income is money you do not work for usually with your time,energy or physical efforts to receive it. It is money you earn whether you work or not. Active income: Active income is the money you have to show up to earn,To earn this kind of income you will be actively engaged or involved . You have to spend your time or energy to earn an active income. These I believe will set the new pace for our next discussion on Ways of Making money.